Alfred Lambert's story is one of a double family tragedy. Sadly he and his younger brother Robert, were both killed in action on the same day. Albert was born in Hadleigh in 1888. 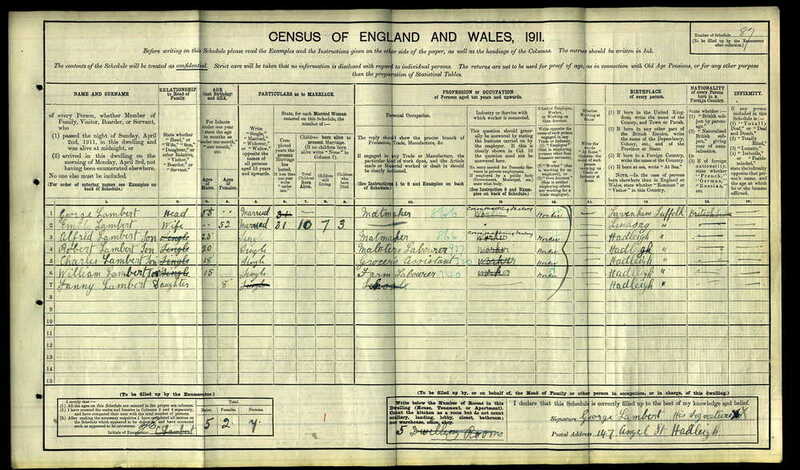 The 1911 census has him living at home with his parents; George and Emily and his siblings; Robert (20), Charles (18), William (15) and Fanny (8). At some point before 1915 he married Eva Jesse Leeks. Once mobilised the 1st/5th Suffolks spent a number of months carrying out home service tasks. At that time territorial units were liable for home service only and were not required to deploy overseas. However, when it became apparent that more troops would be needed for overseas service, the men of the battalion were asked to volunteer. After giving this some serious thought, 72% of the men volunteered and the battalion was redesigned 1st/5th Suffolk Regiment. Those who opted to stay on home service duties only, became the 2nd/5th Suffolks. On that day, at least 16 men from Hadleigh were killed. Due to the nature of the fighting, their bodies were never recovered from the battlefield until the early 1920s. By then the remains were unrecognisable and could not be identified. The remains were most likely buried in Azmak Commonwealth War Grave Commission cemetery in an unmarked grave. This cemetery is in the area were the Suffolks held the front line. Their names are commemorated on the impressive Helles Memorial which stands on the southern tip of the Gallipoli peninsular. 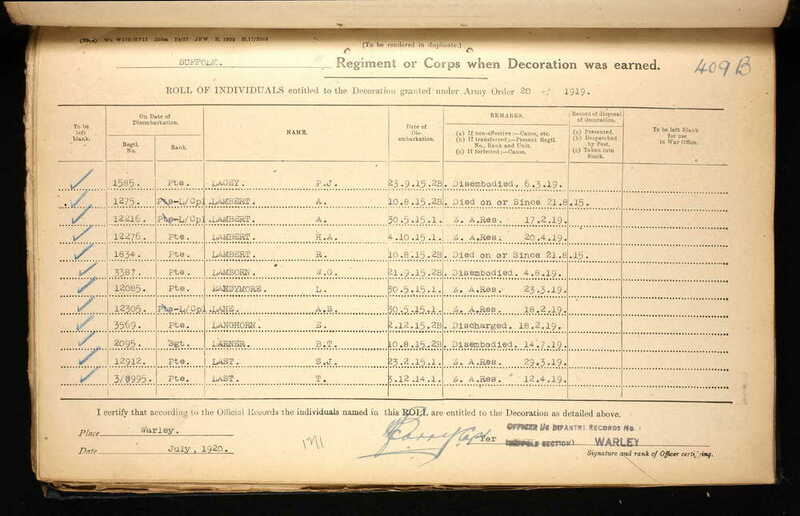 We are not exactly sure when Albert enlisted into the army, but going by his regimental number and his rank we think he enlisted some time before 1912. Service with the 5th Suffolks, the local territorial battalion was appealing to many young men as it offered a taste of adventure, camaraderie and best of all a free two-week summer camp each year. If we assume that he had joined the battalion before war broke out then we know that he would have been mobilised on the night of the 4th/5th August 1914. Alfred Lambert's medals and memorial plaque. The 1st/5th Suffolks completed their training and preparation and were re-equipped for service in the eastern theatre. They embarked along with the rest of 163 Brigade and the 54 Eastern Division at the end of July from Liverpool bound for Gallipoli. A few days later they were relieved and returned to the reserve trenches where they discovered that the attack had cost them dearly; 11 Officers and 178 Other Ranks were killed, wounded or missing. Although official records suggest that many of the Suffolks went missing on or after the 21st Aug, we now believe that they were actually lost during the advance on the 12th. In 2002 a new housing estate was built in Hadleigh. A number of the houses on the estate were allocated as military quarters for service personnel serving in the area. During the planning phase for this development it was decided that since the estate would have a military connection, that the street names would be named after local military heroes. Lambert Close was named after the Lambert brothers. 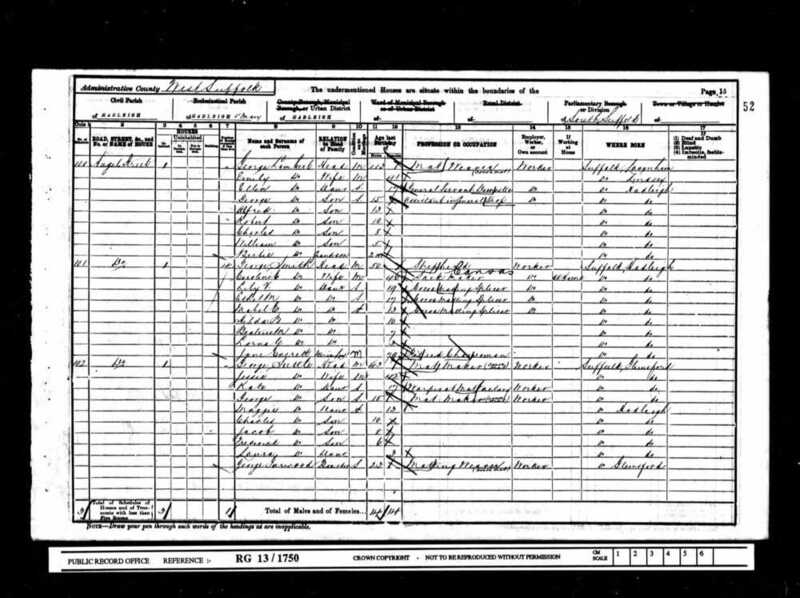 We hope that this page has been able to tell the story of Alfred Lambert. If you know of any information which might help to add to the story then please get in touch.